Kinsale captured the first green pennant in the club's 106-year history when they beat Hermitage 3-2 in a heart-stopping finale to the AIG Jimmy Bruen Shield at Thurles. Trailing 2-1 but with two matches "dormie", the Cork club had to suffer to end their long wait as Paul Shanahan and Rhys Reynolds lost the last three holes in what proved to be the decisive match but took the title when Shanahan made an eight-footer for a bogey six at the 19th. "We just got over the line by the skin of our teeth," said a delighted Kinsale manager, John O'Neill. "The match should have been over an hour ago but that's matchplay for you. You never know." Shanahan and Reynolds lost the 16th when Shanahan left a bunker shot in the sand and Reynolds picked some leaves out of the bunker as he prepared to play and immediately lost the hole when Hermitage's Richard Gladney asked the referee for his ruling. They then lost the 17th to a bogey and conceded the 18th after finding the trees both left and right. On the par-five 19th, both teams were in the left trees and right rough but while Kinsale found trouble short left in three, Hermitage missed the green right with their third. Both sides were just off the green in four but Kinsale had the easier putt and after Gladney overhit hit approach putt through the fringe and ran 35 feet down a tier, they were still away. His partner, Louis Hemeryck came up four feet short and after Reynolds had putted up from behind the green to some eight feet short of the hole, Shanahan kept his nerve and stroke home the right to left breaking bogey putt, walking it in as it honed in on the target before being mobbed by Kinsale's army of supporters. "We were hoping to wrap it up on 17 but that's golf," said Shanahan (46) after his historic putt. "To be fair to the lads, they brought us down 19. They must have been nervous too. "Over the putt, I checked with Rhys and we agreed it was a ball outside the right. And in it went. It was fabulous. I could see it going in and normally, if a putt is going in I would chase it. It was just fabulous." Team manager O'Neill was emotional at the finish and following Kinsale's Barton Shield semi-final defeat to Dundalk on Thursday, he hopes the club's Jimmy Bruen Shield breakthrough opens the floodgates for more Kinsale teams to add to Saturday's triumph. "It means everything to the club," he said. "After 106 years trying this is our first national title. They all laughed at us when we put the lights around the putting green in winter when it was snowing. "But we kept plugging away. All we ever wanted was a chance and that's it. I am delighted for all the fellas here and those who came before us and those who will come after us. "Hopefully that has blown the door open now for Kinsale to come through in everything else." As for Shanahan and the great drama that unfolded down the last few holes, he said: "I grew up with Paul Shanahan. We played pitch and putt in the old pitch and putt in Carrigaline and if I wanted anyone going down there, I'd want him. He can chip and putt and his head was always there. "It went a bit ropey because we were dormie three, but we always had the initiative. We could do nothing about a couple of bad shots on 18 but we dug deep. That's the thing about this team. They will fight for you. We are not the best golfers but on any given day we will give it to anyone." Aidan Cremin & Ruairi Dwyer bt Evan Lester & Fergus O’Herlihy 6&5. 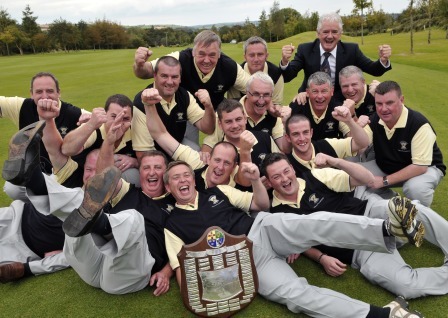 A jubliant Newcastle West side following their win in the Pierce Purcell Shield All Ireland final 2012. Picture by Pat CashmanNewcastle West ended a 40-year wait in style when they cruised to a convincing 4-1 win over Connacht champions Gort to claim the Pierce Purcell Shield in the Chartis Europe Cups and Shields finals at Kinsale.